This weekend I hosted a little maemo hackfest with my friend Mike with my goal being to get PenguinTV to launch in the maemo development environment. This meant building python support for mozilla embedding, which was hard. I’m used to checking out code and then building it, but the process of building the microb-engine packages was incredibly obtuse, and had no documentation. But I tried one thing, then another, then another, and finally it worked. I always have to do some extra gymnastics because my program requires a lot of special startup initialization and shutdown finalization, but other than that the port was nice and straight-forward. I’m now working on using all of the maemo-specific features like hardware buttons, network connection, and system messages. It should just be a matter of hooking up to some basic signals to existing functions. My only big concern about is the “state-saving” feature that allow hildon to completely shut down a program when the user switches away, then restored when the user switches back. Because of all of my threads, database connections, and caches, my startup and shutdown are very slow. I’m not sure if it’s going to be possible to save fast enough. I also don’t know if it’s possible to save the scroll position of a mozilla widget, because when the user switches back they’ll expect to have everything scrolled how they left it. Since gtkmozembed is a black box, it’s just going to start scrolled at the top, which is not acceptable. 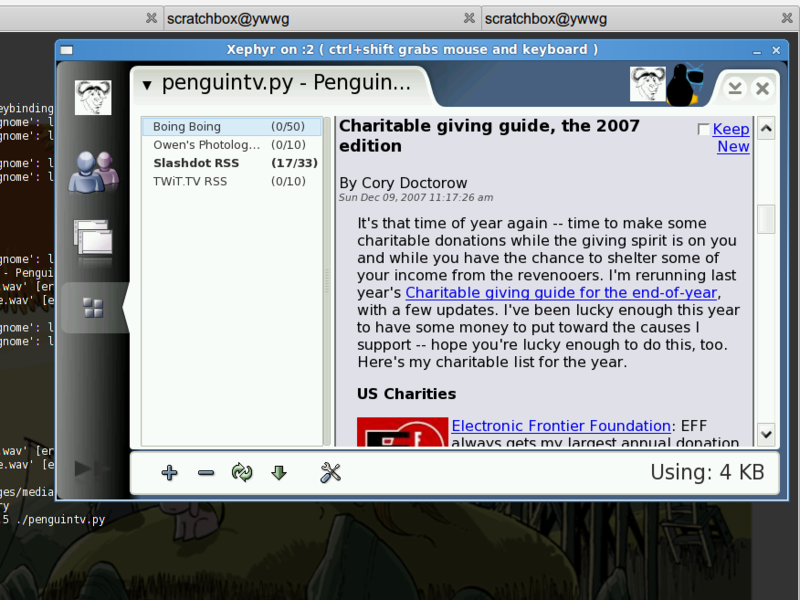 Along with olpc and the desktop, PenguinTV now runs on three different platforms using a single code-base.